Every Thursday, UCLA Dining Services does not serve beef in the main dining halls. Why? For the health of diners and the well-being of the planet. Although their hooves are relatively small, cows raised for slaughter have big environmental footprints. WATER: Beef requires more than 1,500 gallons of water per pound to produce. Estimates vary on this, but 1,500 is the low end. EMISSIONS: Cows are ruminants, which produce a large amount of methane in their digestion process. Methane gas is a greenhouse gas that is 23 times more potent than carbon dioxide. 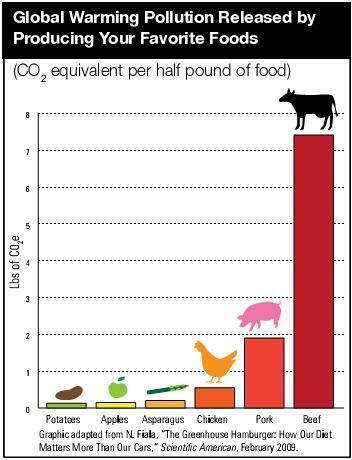 GLOBAL WARMING IMPACT: Ounce-per-ounce beef has 3–10 times more global warming potential than other meats like chicken and pork. On average, we serve up to 1,000 lb of beef a day in the dining halls. 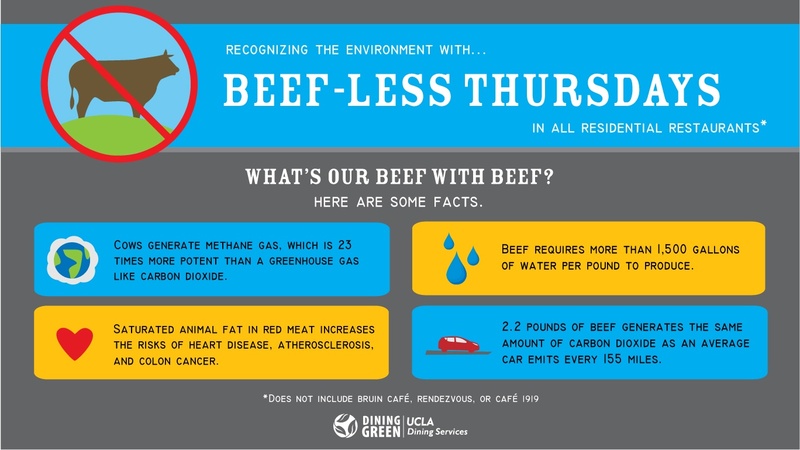 By not serving beef for one day we can save 1.5 million gallons of water and prevent over 2,600 lbs CO2 equivalent from being emitted into the atmosphere. This initiative was started in spring quarter of 2009 and has been embraced positively by the majority of residents, as shown by survey results.